Pop open the can of biscuits. Working on a floured surface, and with one biscuit at a time, roll each biscuit out into a flattened disk. Spread each biscuit with a little pasta sauce, leaving a 1/2-inch border around the edges of the biscuit. Evenly divide the mozzarella and provolone among each biscuit round, sprinkling the cheese right on top of the pasta sauce. Top the cheese with equal amounts of cooked sausage and then add a pepperoni to each biscuit. Top off with a jalapeno slice. Working with one biscuit at time, pull the edges up and over the filling, pinching the dough together at the seams. Place the biscuit, seam side down, onto the prepared baking sheet. Repeat with the remaining biscuits. In a small bowl, combine the parmesan, garlic powder and oregano. 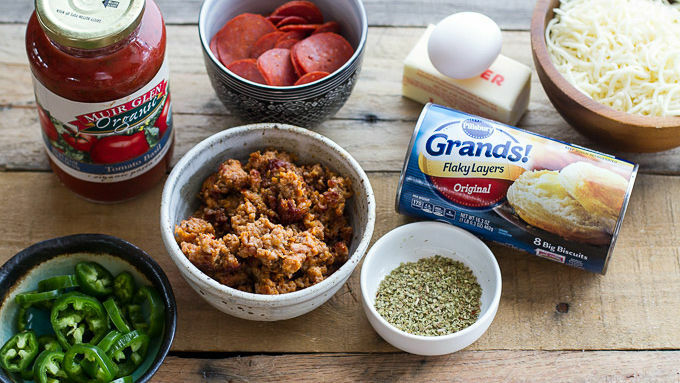 Brush each pizza bomb with the beaten egg and then sprinkle with the parmesan-spice mixture. Finally, sprinkle each pizza bomb with kosher salt. Bake in the preheated oven for 20-25 minutes or until lightly golden on top. 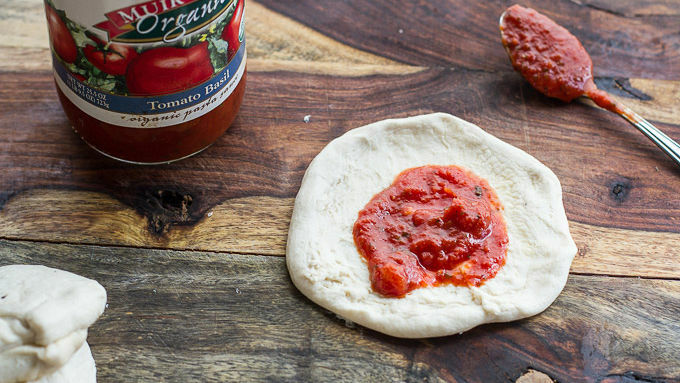 Serve with more Muir Glen™ organic tomato basil pasta sauce on the side for dipping. These can be prepped in advanced and refrigerated until ready to bake. When ready to bake, remove the bombs from the fridge while you preheat the oven. Bake as directed. 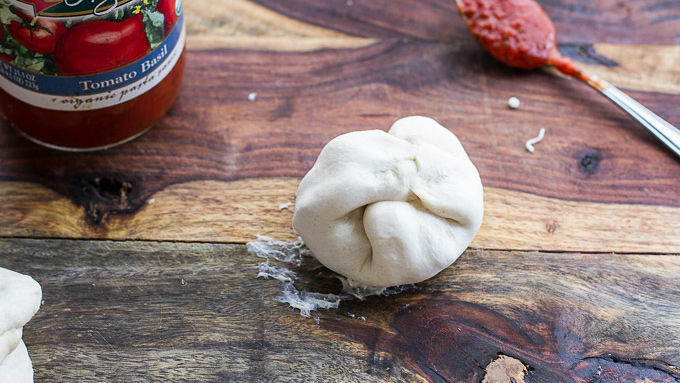 Once the Pizza Bombs have been cooked, you can then freeze them. To reheat just bake the pizza bombs in a 350ºF oven for 15-20 minutes or until warmed throughout. 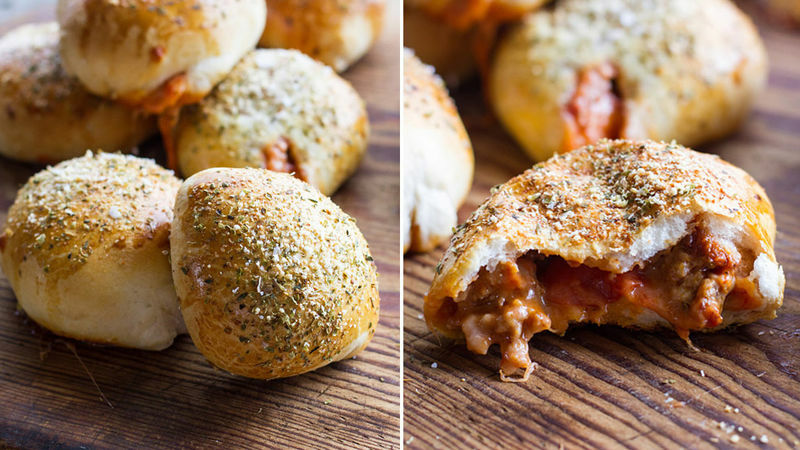 Like mini calzones stuffed with cheesy sausage and pepperoni pizza. Not kidding. Got a party to host or attend? 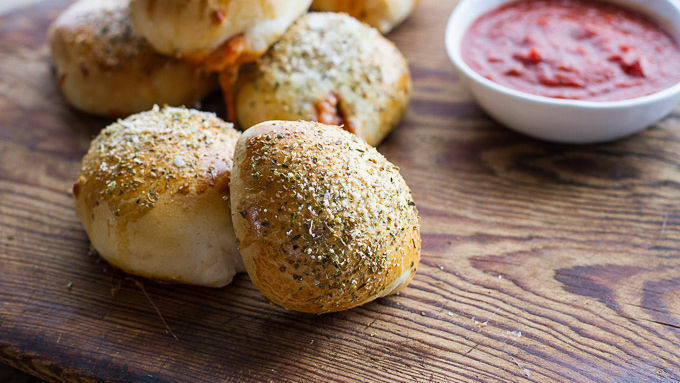 Don't do it without these cheesy little pizza bombs. Sausage and pepperoni pizza. It’s a classic. And it’s delicious. 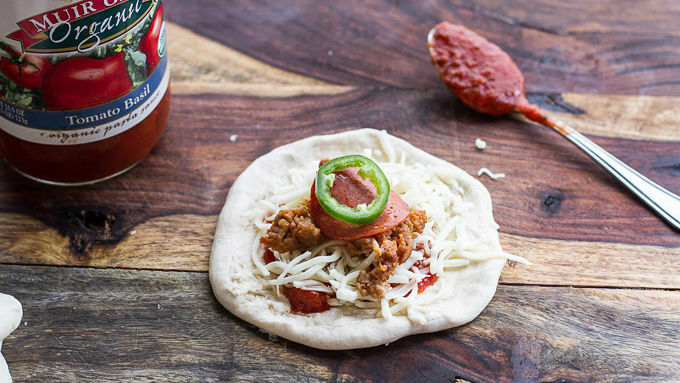 So let’s make it even better by turning that classic combo into some cheesy, spicy, delicious and well ... easy! 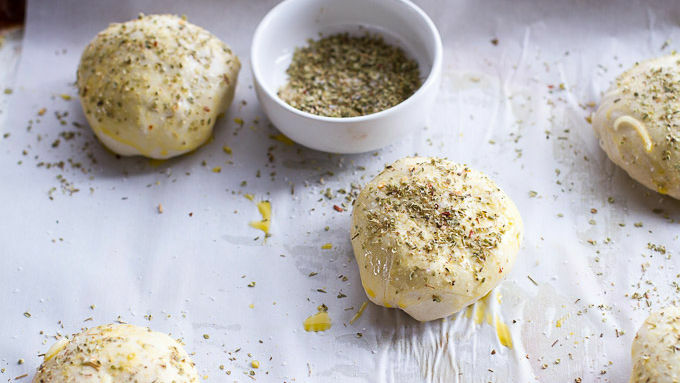 These Pizza Bombs are all your fave pizza ingredients bundled up in a soft herbed and salted dough. It’s kind of like unwrapping a gift, but it's FOOD. To make things simple, I used Pillsbury Grand Biscuits for the dough. When you stuff it with cheese and pizza goodies, then sprinkle it with more cheese and a little salt ... voila. Pretzel-y crust just like that. Oh, the cheesy goodness inside! These can be prepped in advanced and refrigerated until ready to bake. When ready to bake, remove the bombs from the fridge while you preheat the oven. Bake as directed. Once the Pizza Bombs have been cooked, you can then freeze them. To reheat just bake the pizza bombs in a 350ºF oven for 15-20 minutes or until warmed throughout. Serve with more Muir Glen Pasta Sauce, and dig in!